This heartfelt, hand-wrought candleholder makes a romantic focal point for your table. 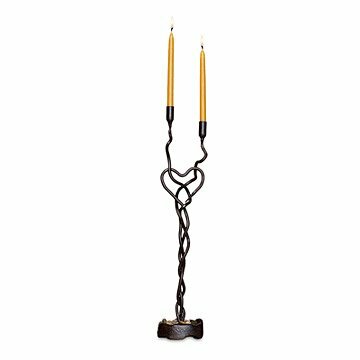 Like two independent spirits intertwined in a heart-shaped union, this hand-wrought, cast iron candleholder makes a romantic focal point for your table. Handmade by Luis Marquez in Texas, it makes a perfect gift for a sixth anniversary, when the traditional element is iron. The base holds an included assortment of decorative pebbles, and the set also includes two beeswax candles (refills also available). After working for many years with different artists, Colombian artist Luis Marquez learned the various techniques for shaping materials such as iron and glass. He discovered a passion for working with his hands and natural, sustainable materials like iron to design and create unique, functional pieces inspired by nature. Luis says, "I love to heat, bend, and twist iron to create anything that I dare to imagine, to be enjoyed for a lifetime." Candle Holder: 18.5" H x 3.5" dia. ; Candles: 6" H x .5" dia. Candle holder ships with 2 beeswax candles. I bought this a second time! I sent it to our niece. As a newlywed, she loves it not only because it is great looking but because they do not have too many "decorative" pieces! This was a beautiful product. I was unhappy that the candles were not standard sized. It will be hard to find new ones for them without going to a specialty shop. This was an anniversary gift for my son and son in law. I love the symbolism of two lights joined by one heart.